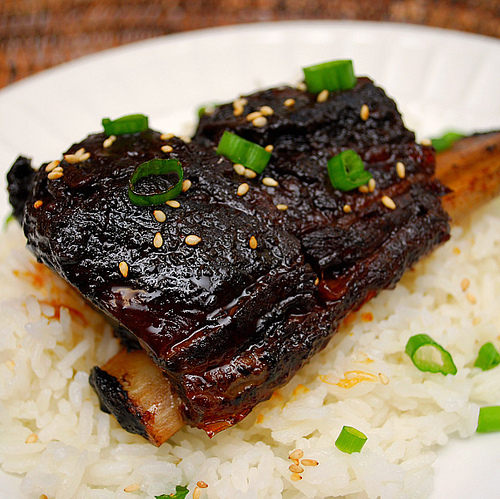 Korean short rib, or galbi/kalbi, usually involves flanked short ribs. I used the English cut short rib instead but either could be used in this recipe. The marinade is cooked along with the beef and when pressurized, the flavors are intensified and better absorbed in a shorter amount of time. You could even place the beef with the marinade in a storage bag in advance so that everything can be placed in the Instant Pot after a long day with little preparation. Leftovers of this (assuming there are some left!) are even better the next day. The marinade or remaining sauce after cooking is great as a thin sauce to serve over the ribs and rice. I've also used leftover meat in salads and Korean style tacos! Add the beef ribs to the IP. In a small bowl, combine soy sauce, brown sugar, oil, vinegar, ginger, garlic and red pepper. Transfer mixture over the ribs in the IP. Press MANUAL and adjust the time to 15-20 minutes on HIGH pressure for English cut/7-8 minutes on HIGH pressure for flanken cut. When the IP beeps after pressure cooking, allow your IP to naturally release pressure for 15 minutes. While naturally releasing pressure (also known as NRP or NR), the display will reflect numbers counting up from 1. The numbers indicate how many minutes the IP has stopped cooking since it beeped (or how many minutes it has been naturally releasing pressure). No need to touch your IP while it naturally releases pressure. When the display reflects the 15 minutes since the IP has beeped, turn the setting on top of your IP to VENTING. Doing so allows the IP to quickly release pressure (also known as QRP or QR). I use a wooden spoon to carefully turn the setting to avoid close contact with the potential steam. You may also want to turn your IP away from cabinets to allow the released steam to escape freely. The pin at the top of your IP will drop when all pressure has been released and it's safe to open. Using tongs, remove the ribs serve over rice and garnish with green onions and sesame seeds. Alternatively, you can also remove the ribs from the IP and transfer them onto a baking sheet. Broil the ribs in the oven for a few minutes until your desired char or color is reached. Been looking for a real yummy Korean short rib recipe like this that can be made in the instant pot and this one looks amazing! So thrilled I found this. Can you please tell me if it’s ok to substitute boneless short ribs or if doing so will not work in this recipe? Hi Heather - thanks for your comment! You can absolutely substitute boneless short ribs in this recipe and I would reduce the cook time to 25-30 mins. What do you mean by “one head of garlic”? About how many cloves of garlic or teaspoons do you mean? Made it today and my husband went crazy for it and said to not make short ribs any other way but yours so thank you so much - it was a big hit and tasted as yummy as I had imaged it would. Hi, I recently got an instant pot and the instructions say to use at least 18 oz of liquid for pressurized cooking. Any comments? This was awesome!! I served it in lettuce cups with a radish, carrot and cabbage slaw I made with rice wine vinegar and sesame oil. I substituted 2 Tbs gochujanng for the red pepper flakes. I finished on the grill for about 5 min. then brushed on the sauce I reduced in the IP to make a beautiful glaze. Just made these tonight and the family LOVED them! Not one piece left! I did marinate overnight so I had less to do today. I had almost 8 lbs of ribs so cooked for almost 50 minutes with NPR. Fall off the bone tender and soooo tasty! Thanks for sharing! This will be on my regular rotation! I don't use soy sause. What can I substitute it with? Thanks. What would the cook time be if I double the recipe? You can keep the same cooking time and check for doneness. You don't indicate any liquid. Do I need to add one cup of water or beef broth? Has anyone cut this recipe in half? What cook time did you use?